La Salle Prep's Kainoa Taylor was in the right place at the right time for the Falcons on Thursday night. Taylor followed up a shot by Emmanuel Arredondo and scored off the rebound in the 68th minute, lifting the Falcons to a 2-1 non-conference boys' soccer home win over the Titans. Luke Strange scored La Salle's first goal in the 38th minute to help the Falcons run their unbeaten streak to 3-0-1. West Salem's Adam Krivak scored on a header in the first minute of the second half, but the Titans (2-3-1) were not heard from again after that as they sustained a third straight loss. "A pretty big win," said Taylor, one of two sophomores on La Salle's varsity roster. "We boosted our confidence a lot, just based on the fact that this wasn't one of our best games, but we came through with a win. We did what we had to do." La Salle also won with assistant coach Matt Owen running the show while Falcons coach Seth Altshuler was away in Michigan to attend a family wedding. "I was definitely proud of the way that the boys reacted to getting hit on the nose like that," Owen said. "We had a pretty good first half for the most part and had some spells where we were really doing well. "The second half, within 30 seconds we got scored on, we lost the lead, and the boys really had to react. They had to really take some time to make sure they had their minds right and they came out on top with it. I was really happy that they were able to do that." 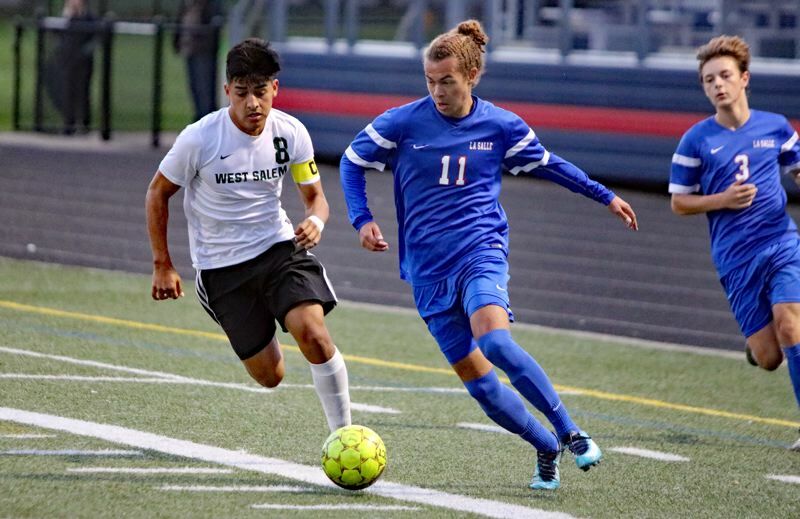 West Salem went into Thursday's match stilling reeling for a 4-0 loss at Cleveland and a 3-0 loss at home to West Linn, prompting Titans coach Eddy Soboll to move forward Eric Elizarraga-Oregel to center back in the 4-3-3 formation. "I have two starters from last year, and of our four seniors, one is ineligible and one of the other three is a starter, so it's a rebuilding year," Soboll said. "Not having the experience makes it hard. It's just where we're at. "The hole that we're digging, though, it's going to be hard to get out of it, but we've got to find some way." La Salle scored the game's first goal on a counterattack as Strange, the junior forward, outran the West Salem defense with the ball down the right wing, broke in alone of Titans goalkeeper Zechariah Hines, and fired a low shot that went off the far post and into the net with 2:03 to play in the half. West Salem answered 27 seconds into the second half when Yahir Bernai Renteria drove the ball down the right wing, sent a cross through the 18-yard box near the far post where Krivak was in position to head the ball back across the goal and past Falcons keeper Quintin Castner to make it 1-1. "When West Salem came out and scored right way, it kind of brought us all down and we needed to bring it back up," Taylor said. "We were struggling a bit, but as the second half went on, we brought up the possession and eventually broke through." Arredondo, who had come off the La Salle bench in the 57th minute, set up the go-ahead goal when he got behind West Salem defender Jonathan Duarte on the left wing and went one-on-one with Hines, the Titans' keeper. Hines made a diving save on Arredondo's left-footed blast from 10 yards out, but left the rebound out in front of the right post. Taylor crashed the goal from the right wing and was all alone with Hines still on the ground as he scored with 12:39 to play. "Manny takes a shot, it hits off the goalie, and I follow it in," Taylor said. "If I wasn't there, the game might have turned out differently, but I followed the ball, kept my composure, and hit it in the back of the net." West Salem had an opportunity to score the equalizer off a free kick in the 75th minute, but Kaden Young's shot from 30 yards out sailed high over the goal. "I think this win was good in terms of the 'feel good,'" Owen said. "The boys feel good about themselves and we're on a good little run here, going through a tough stretch of games before we get into conference. "I think this just helps breed confidence, but I think there's also got to be some perspective, in that tonight we were run real close by that team. It was a bit of a wake-up call to make sure that we're on point at all times." The Falcons return to action Monday at home against Hood River Valley (1-2) at 7 p.m.